Q. What do Christmas crackers, mulled wine, Santa hats, office parties, presents, candles, pine trees and mistletoe have to do with ancient Rome? The Saturnalia was one of the most popular festivals in Ancient Rome, possibly going back to Etruscan times. A sacrifice of piglets was made to the god Saturn along with other rites, and there followed several days of feasting and fun. It was the custom to greet one another with the phrase Io Saturnalia! (Yo Saturnalia?) One of my Roman Mysteries, The Twelve Tasks of Flavia Gemina, was set during the mid-winter festival and I'm currently working on another one for my new Roman Mystery Scroll series, provisionally titled The Thunder Omen. I. WINTER SOLSTICE - The Saturnalia began on December 17, a few days before the winter solstice. The Saturnalia was essentially a pagan festival to bring back the sun. And some Romans celebrated the birth of a new god from the Middle East at this time. II. BIRTH OF A GOD - Some scholars believe that the Persian god Mithras and/or the Roman god Sol Invictus had birthday celebrations on the winter solstice which fell on 25 December in the Roman calendar. It wasn’t until about AD 400 that church leaders decided to celebrate the birth of Jesus on this day, possibly in an attempt to overlay and obliterate these 'pagan' holidays. III. GREENERY - Around mid-winter, the Romans decorated their houses with greenery. This was a common act of sympathetic magic used in many so-called 'pagan' societies. That’s certainly where our custom of Christmas wreaths and mistletoe come from. IV. LIGHTS - Romans also decorated their houses with extra lights at this darkest time of the year. Again, this was a primitive attempt to coax back the sun. Torches, tapers, candleabra and oil-lamps flickered in the houses of those who could afford them. V. FEASTING. In mid-winter, instinct tells us to build up a nice layer of fat, to feast in preparation for lean times ahead, like bears before they hibernate. The Romans were no different from us in this respect... except that they had no chocolate! VII. CELEBRATION (and role reversal, too.) For the five days of the Saturnalia, slaves didn't have to work. They could eat, drink and be merry, and some even switched places with their masters, especially in more relaxed homes. In theory the masters would wait on reclining slaves and the slaves could tell the masters what they thought of them. Most masters probably just left the slaves to themselves, like Pliny the Younger, who retreated to an annex of his seaside Laurentum Villa and let his slaves get on with carousing. During the Saturnalia, children were allowed into the amphitheatre. There was also music, dancing and pantomime (though not our kind of pantomime). VIII. GAMBLING. In first century Rome, gambling was illegal... except during the Saturnalia. For those few days in mid-winter, anyone could gamble: children and slaves included. Children usually gambled with nuts. In Italy and some other Mediterranean countries this practice lives on in the seasonal Tombola and Bingo games, only held at this time of year. IX. CONICAL FELT HATS. 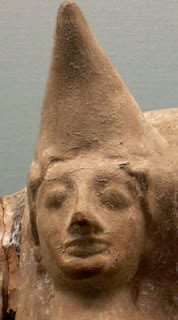 During the festival men (and sometimes women) wore a type of conical felt cap called the pilleum (also spelled pilleus). These hats were traditionally worn by slaves who had been set free. This showed that people were 'free' from the usual restrictions and laws. "Freedom has loosed the bonds for all..." said one Roman author about the Saturnalia. Imagine a conical, red pilleum trimmed with white fur... and you get Santa's hat! X. KING OF THE SATURNALIA. On the first night of the festival in some families, the paterfamilias threw dice to determine who in the household would be the King of the Saturnalia. The 'King' could then command people to do things, eg prepare a banquet, sing a song, run an errand. During his reign, the depraved Emperor Nero used shaved dice to ensure that he would be chosen King of the Saturnalia even though he was already the most powerful man in the known world. (Big bully.) I wonder if the paper crowns in Christmas crackers hearken back to this tradition? XI. GIFTS. Just like us, the Romans gave gifts on the Saturnalia: traditionally candles, silver objects, preserved fruit and especially sigilla: small clay or wooden figures, often with moveable joints. (I guess Barbie dolls and boys' action figures are the modern equivalent.) But the ancient Romans gave gifts of every value and size, from something as small as a toothpick to something as big as a slave. The Saturnalia was traditionally a time of commercialism and shopping. The first century philosopher Seneca grumbled about the shopping season: "Decembris used to be a month; now it's a whole year." Plus ça change...! So as you celebrate Christmas this year, think about the ancient Romans and how many customs they passed down to us. And take this fun QUIZ to see how much you learned! 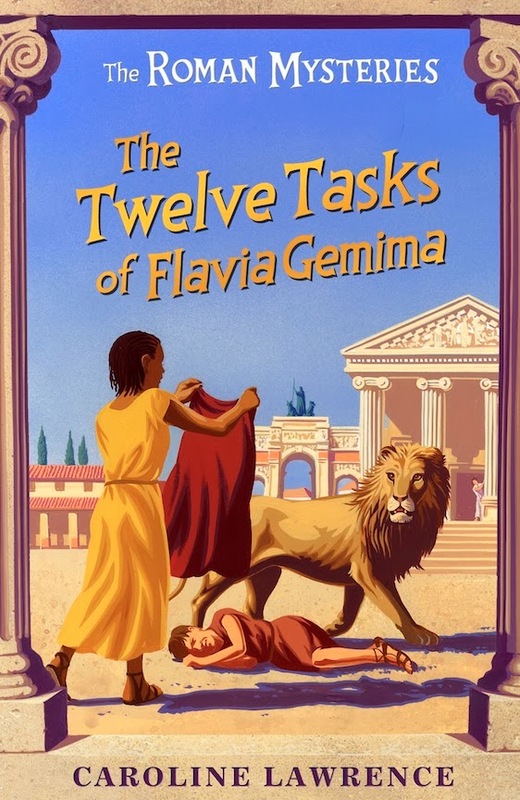 The Twelve Tasks of Flavia Gemina is the perfect Saturnalia gift for a history-loving boy or girl. 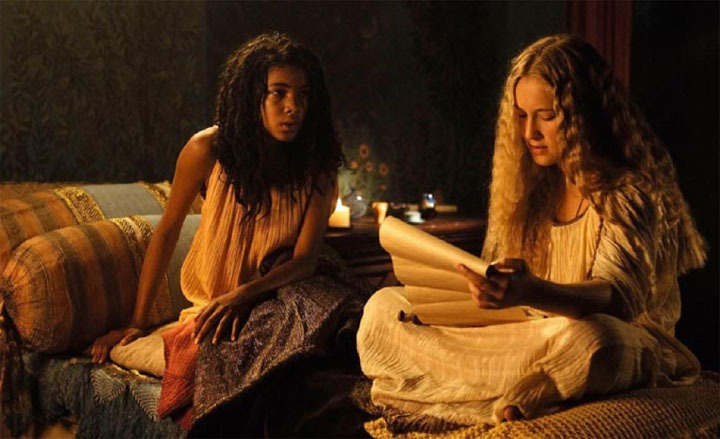 You can also buy both seasons of the BBC television adaptation of the Roman Mysteries books, including the Saturnalia episode, renamed "The Trials of Flavia". Kids will also enjoy The Thunder Omen, a Roman Mystery spin-off. It features a loveable beggar boy, and some dancing Saturnalia chickens. 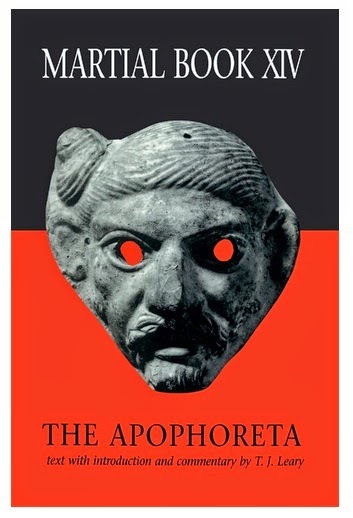 Adult readers will enjoy T.J. Leary's excellent commentary on Martial's Saturnalia poems. I didn't know about the conical hat, that's really interesting! I didn't know that diluted wine killed off bacteria - what a mine of information this blog is! Great images, too, Caroline. Happy Saturnalia! Happy Saturnalia, Caroline! 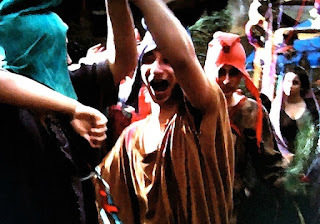 I am always fascinated by how our modern and religious celebrations connect with the ancient pagan festivals... any excuse for a party, maybe? Yo Saturnalia! I love the idea of composing appropriate couplets for gift tags. That would certainly enliven the mind-numbing process of wrapping the Christmas gifts. In your pictures, I see the trace elements of the accoutrements of stock characters in the Italian Commedia dell'Arte too - the tall cap of Pulcinella particularly. It makes a really interesting visual connection between Plautus and sixteenth-century Italy. Children must love hearing about the Saturnalia on your school visits. Do you do Saturnalia reverse role-playing with teachers and children? Or would be too anarchical? Yes, Michelle! I love the continuity! Having kids switch place with teachers would indeed be anarchical. I wonder if any teachers have tried it? When I was teaching Latin to 10- and 11-year-olds we would celebrate Christmas/Saturnalia with a Latin banquet, reclining on a pillow strewn floor eating pitta bread, olives, hummus, grapes and (grape-juice) wine. I would choose a couple of kids to be our slaves and they always vied vigorously for that unenviable position! After our banquet we would finish off with the closest thing to a trip to the theatre for a comic play by Plautus: the fab 1966 musical, A Funny Thing Happened on the Way to the Forum. Great post, although clearly it was the Romans who introduced the festival to Christianity, [it is not a Jewish tradition], we must remember that most pagan pantheons had a Sun God, and celebrated the solstice, a time when the sun dies and is reborn after three days. I love the bit about the hat. Lucky children who had you for a Latin teacher, Caroline! Salve, magistra! Great post, Caroline, thank you! The Santa's hat arguably resembles the Phrygian cap even more, which also came to signify freedom, although possibly through confusion with the pileus. Longer, floppier, and always red when worn by French Revolutionaries. Phrygian caps are associated with Mithras - another mystery cult popular in Rome, which is thought to be associated with sun and the winter festival. I think Mithras's birthday was 25 Dec.
ooops sorry - of course you mentioned Mithras's birthday - I was still obsessing about the hats! [I do have a bit of an agenda about Roman cultural imperialism!]. I'm popping in from Juliette's place at Pop Classics, I've read many of your comments on her blog. It's a pity my students' level of English isn't good enough, because I know one who would love your books! Thanks for the correction, CrazyChris! I think I meant *special* tombola and bingo games are held at Christmas, like the Loteria de Navidad you mentioned.